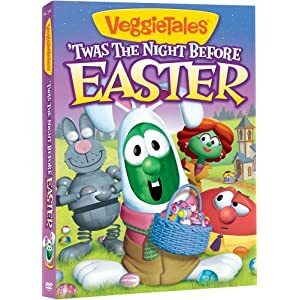 Veggie Tales ‘Twas The Night Before Easter DVD Giveaway and Review! Big Idea’s newest 50-minute “Easter” themed video is an entertaining, colorful, and positive addition to any child or adult’s easter basket. Falling in line with other Veggie Tales’ movies, this one is well made with clean computer graphics, comprised with a story line that captures the interest of little ones, but also dotted with pop culture humor for older siblings and mom and dad making it a film for the whole family. It’s Easter time in Crisper County and cable news reporter Marlee Meade (Petunia Rhubarb) is hunting for a way to help others. On a tip that the old town theater will be shut down, Marlee cooks up a plan to save the stage and make a difference through the power of musical theater. With a cast of costume-clad townies, massive props and a 20-foot robot rabbit – Up With Bunnies is hatched! There’s only one thing missing the star of the show! When news spreads that singing sensation Cassie Cassava (Melinda Doolittle) is arriving to perform in her hometown church s Easter service, Marlee gets worried. Concerned about the competition, she schemes to steal the starlet for her own pageant! But when things go haywire, will it be curtains for Marlee s dreams or will she discover the true meaning of Easter and what helping others is really all about? Find out in this hare raising adventure! As soon as we got the DVD, my two-year-old couldn’t wait to watch it. The next time I did let her watch the TV, this is what was on…and the next time after that, too! She loved the music and action, even if the plot may have been a little beyond her. I enjoyed the parallels to modern things, such as American Idol, but even more so, the polyphonic musical parts that were so intricately designed! The only thing I was disappointed in is that the video eluded to Easter having a deeper meaning than bunnies and chocolate, but it never was really elaborated on. Now, I can’t say that this ruins the movie for me, though, http://rcm.amazon.com/e/cm?t=life0fd-20&o=1&p=8&l=bpl&asins=B004FZWDT2&fc1=000000&IS2=1&lt1=_blank&m=amazon&lc1=0000FF&bc1=000000&bg1=FFFFFF&f=ifrbecause I don’t think that people taking Christianity and trying to combine it with the actual holiday of Easter really works…so I guess I kind of appreciate that this movie promotes more than the materialism of Easter but then leaves it up to parents to determine explaining what relationship they want between Christ’s death and resurrection and Easter. For my family, this video provides a great opportunity to talk about what Easter means in our modern day culture, how many Christians attempt to blend Easter with the resurrection, and then how this all relates to what we do in celebrating Passover and the resurrection separate from Easter. Any way you look at it, this is a positive item you could put into an Easter basket, so add it to your list for Sunday! Not only can you buy it in stores, but you can purchase it on Amazon.com. If you want it real quick, Amazon.com has an instant buy or rent feature for this movie that allows you to download it and view it on your computer or TV. $10 Subscription to a Ranger Rick Magazine! I just missed it! Hope you are well!